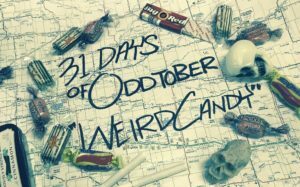 Brett and Amy kick off ODDTOBER with a deliciously disgusting rundown of some odd Halloween fare. From sweet bags of blood to hairy gumballs, we’ll take you out of your culinary comfort zone and tickle your pallette with these sweet treats. We also ramble on (as Brett and Amy so often do) about our own favorite and not so favorite candies. Don’t forget your toothbrush because this episode of the Travel Oddities Podcast is going to be sticky.